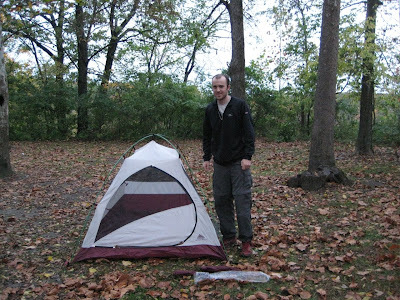 Rob and I went camping at Kickapoo State Park last Friday night. Kickapoo is one of the parks that is scheduled to be closed on November 1st as a result of irresponsible budgeting that has apparently left Illinois without enough money to keep its state parks open. Rob and I were both really upset about the park closures: Rob—because he spent a lot of time at Kickapoo while he was growing up, and me—because I just love trees. We both signed petitions protesting the park’s closure and wrote to the governor and other state representatives, imploring them to keep it open. As I realized how close November 1st is looming, I suggested that we go and camp there one more time. Probably not the wisest choice for someone who has been wearing 10 layers of clothing indoors for the past several weeks, but I thought I could handle it. It wouldn’t be a Ragfield Family Camping Trip if it wasn’t pouring down rain though. I’m not sure if Rob and I have ever camped together when it wasn’t raining. For the most part it was just a light mist, and since I had doubled the already ridiculous amount of clothing I have to wear to keep warm, it really wasn’t that bad. We Ragfields like to travel light. Dude #1: DUDE, I’M, LIKE, NOT GOING TO GO TO SLEEP AT ALL TONIGHT. I’M GOING TO GO TO THE F*CKING FOOTBALL GAME TOMORROW WITH, LIKE, NO SLEEP. Dude #2: (laughing as if this is the most hilarious thing he has ever heard) DUDE, YOU SHOULD, LIKE, DRINK SOME OF (some other dude’s name) 600 CANS OF RED BULL. HE’S GOT LIKE 800 CANS. I couldn’t help but think of something Prof. Pablo once told me: “Melissa, the world is full of morons.” Indeed. This was the moment that I decided I wanted to remove my name from the “Save Kickapoo Park” petition. 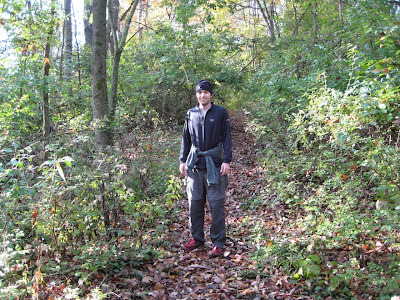 I do want to save Kickapoo State Park, but not from closure. Rather, I want to save it from people like Dude #1 and Dude #2 and what sounded like 50 of their closest, drunkest, screaming, friends. And if closing the park would do that, then I’m all for it. I hate it when people trivialize nature. The trees deserve our utmost respect. The birds and deer and crickets and squirrels need their sleep. They don’t need irreverent drunk people (who apparently feel that “No Alcohol Allowed” signs are a big joke) disturbing the peace. I wish that people would learn to appreciate this planet. Dude #1’s desire to stay awake all night kept me up all night too. I’m not sure that I slept at all. In the morning when I crawled out of the tent, I saw an empty “Budweiser” carton, and somebody who was sleeping inside a running car. Come on. Nobody is colder than me, and I managed to get through the night without going to the car and turning on the heat. Knowing that this might be the last time for the foreseeable future that we’d get to be at Kickapoo park, Rob and I went hiking around on some of the trails. During our hike, we saw two deer. The deer stopped and we stopped, and we all just stood looking at each other for the longest time. They were really quite beautiful deer. We headed home a little while later, and I forced myself to go out and do a 12 mile run. In general, the first “long” run of the taper can be quite grueling. I don’t know why, it just is. I was prepared for the worst this time, especially knowing that I had not gotten any sleep at all the night before. But it went by pretty well, so now I’ve got that done. Dude, its like, getting late, and I’ve, like, got a lot of stuff to do tomorrow, so I’m, like, going to go to sleep. I'm glad you guys got to camp one last time at Kickapoo State Park before our irresponsible State Government closes it. We too signed a petition (at work) and on-line. I know a lot of people did the same as we continued to forward the email to friends and family. In fact, our friends have been camping there every weekend in October, like you trying to use it up before they close. The fall is the prettiest time of the year. I'm so sorry it wasn't a pleasant experience because of the "morons". Worse than a moron is a 'drunkin' moron'. When you have memories, try to remember Kickapoo as the beautiful park that it is! Melissa, your professor friend is correct, we can't get rid of the "morons" in the world. Next time you want a nice quiet place to pitch a tent. Come to our place, we have LOTS of trees, squirrels, deer, wild turkey, raccoons and who knows what else might be wandering around in the middle of the night. You 'for sure' won't have to put up with any morons!!!!! 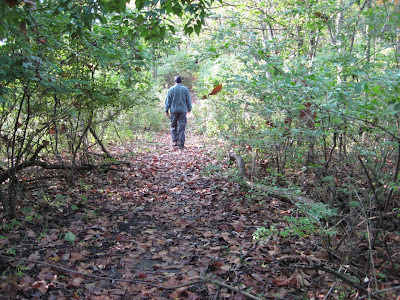 Little hard walking through our woods because it has gotten so grown up with (you name it). We use to have cows in those woods and they kept it cleared out pretty well. But, that has been about 10 years now, so if you want to bring a hatchet and make some paths to walk on, have at it. And, I am with you on wearing layers of clothes to keep warm, I have been doing that also for the last couple of days. It takes my body awhile to get use to the changing season. I really mean it, if you ever want to camp out, just let your Mom know, and she can tell you how to get here. Plenty of wood to make a campfire!!! !